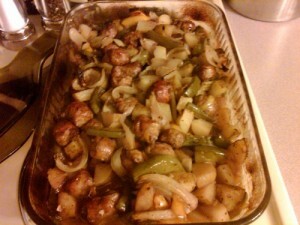 I know this dish looks a lot like some of the others but trust me, it tastes completely different! YUM! Bring 6 cups of water to a boil in a large pot. Cook fettuccine as directed on package. In the meantime, heat 2 tablespoons of extra virgin olive oil in a large skillet over medium heat. Add onions and saute until somewhat translucent, about 3 minutes. Next add the ground turkey and salt/pepper, break up turkey as small as you can and cook until no longer pink, about 5 minutes. Then add the tomatoes and garlic and combine. After about 2 minutes, add the chicken stock. 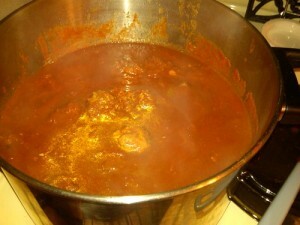 Reduce heat to medium low, cover, and let simmer for about 5 minutes or until tomatoes and stock are cooked down. Once fettuccine is finished, drain and add to the mixture. 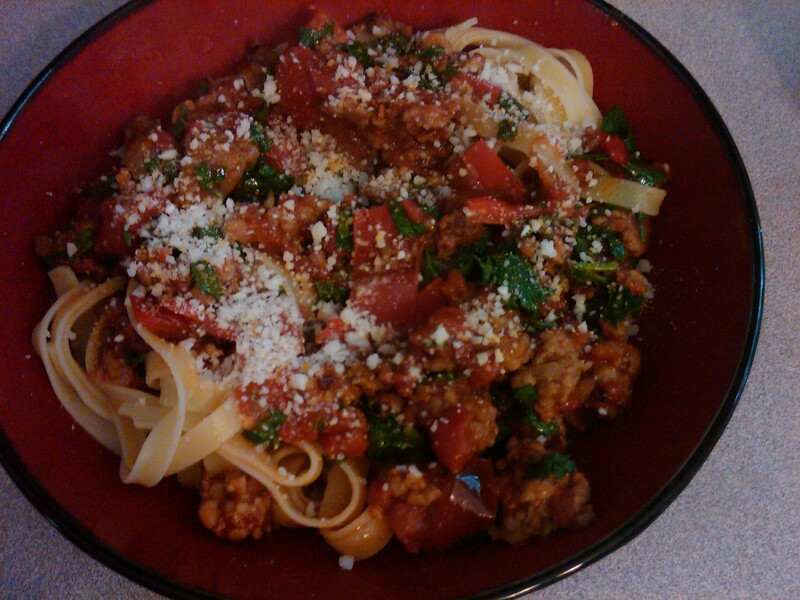 Toss with basil, parsley, grated cheese, and crushed hot red pepper. Serve. In a large pot, bring 6 cups of water to a boil. Cook fettucini as directed on box. In the meantime, add two tablespoons of extra virgin olive oil to a skillet and heat over medium low. Add garlic and saute for about 2-3 minutes- DO NOT BURN. Turn heat up to medium and add the wine and lemon juice. Once the liquid is reduced a little bit (about 3 minutes), then add the shrimp, salt and pepper. The shrimp cook fast, about 2-3 minutes or until pink. Reduce heat to medium low then add the spinach. Mix until spinach starts to cook down. Add fettucini to the skillet and toss. Top with grated pecorino romano cheese and crushed red pepper. I’ve been eating this potato salad practically since birth! I prefer it over the mayonnaise-based potato salads as it is much healthier and flavorful. The only thing different I did than my Nana is that I added some sliced Napa cabbage because I had a little bit leftover and needed to use it up. It was a pleasant little addition! Let potatoes cool a little bit then in a large bowl, mix together with all of the other ingredients. Cover and chill in refrigerator for at least 30 min (the longer it stays, the more flavorful it will be so this can be done the day before). You may need to add a little more olive oil/vinegar as the potatoes will absorb some of it while in fridge. This can be served with pretty much anything- burgers, chicken, ribs… or just as is. In a large bowl, combine turkey, 1 egg, 4 cloves of garlic, Italian breadcrumbs, parm cheese, salt and pepper. Form into meatballs, about the size of a golf ball (will make about 10 meatballs). You can either cook them in the oven (preheated @ 375 for 30 min) or on the stove top in a little olive oil for about 20 min until no longer pink. Set aside covered with foil. In a medium sauce pan, heat some olive oil and the other 2 minced garlic cloves over medium low. 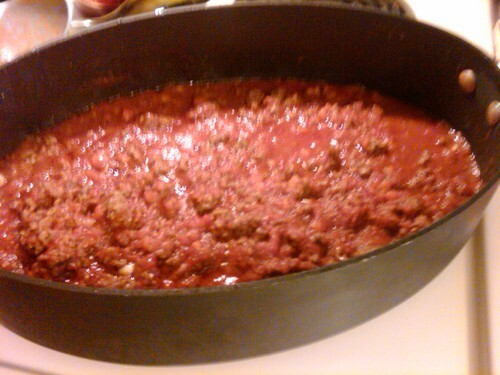 Then add the can of crushed tomatoes, salt/pepper, cover, and simmer over medium low for about 20 min. Heat more olive oil in a large skillet (you can use the same one as the meatballs just add a bit more oil). Add Panko crumbs to one shallow dish and in another shallow dish, beat eggs with a teaspoon of water. Generously salt and pepper the zucchini coins then one at a time, coat in egg first followed by the bread crumbs. 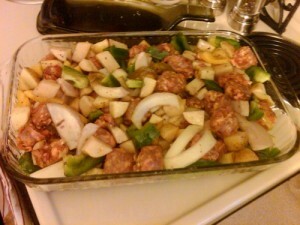 Place in the heated olive oil and cook about 3 min per side, until the coating is golden brown and zucchini tender. An Italian classic in my family. In the fall/winter I make this at least twice a month. In the summer, I use sausage patties and cook everything on the grill instead of the oven. Preheat oven 400 degrees. Put sausage, peppers, onions, potatoes, and garlic into a large baking dish. Then add a few drizzles of olive oil and mix together. Next add the wine, salt/pepper, basil, and red pepper flakes and combine. Cover with foil and bake for about an hour. Then remove foil, turn oven up to 450 and continue baking uncovered for about 15-20 minutes until browned. Serve with a side salad or this super easy grape tomato salad. 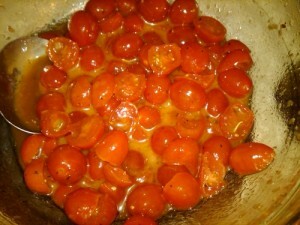 Combine a pint of grape tomatoes (halved), about a tablespoon of grated onion (chop off a small hunk of onion and grate with microplane over bowl) 2 tablespoons of extra virgin olive oil, 2 tablespoons of red wine vinegar, salt/pepper. 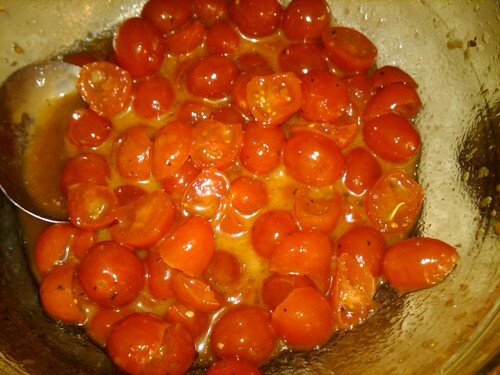 I make this a few hours ahead of time so the tomatoes have time to marinate in the dressing. 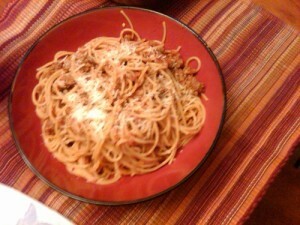 Bolognese is a meat-based sauce that originated in Bologna, Italy. Typically it’s a thick sauce that contains more meat than tomatoes and is made with butter as to give it a unique flavor. One of my favorites!! In a large skillet, saute carrots and garlic in both butter and olive oil for about 3 minutes over medium heat. Then add the ground beef, salt/pepper, and cook until no longer pink, about 5 minutes. Next add the can of tomatoes, cover and cook over medium low heat for about 30 minutes, stirring ocassionally. Cook spaghetti as directed on package. Drain and mix together with sauce. Serve sprinkled with parm cheese and (as I always add to pretty much everything) some crushed red pepper flakes. You’ve probably heard the debate: is it sauce or gravy? Some (like my family) refer to it as gravy when it’s cooked for a long time and usually with a meat base- whether it be meatballs, sausage, pork shoulder, chicken, etc…. On the other hand, sauce is a quick-cooked concoction without the meat. I was taught at a very early age how to make this gravy. I ended up creating my own version using the same method and basics I learned from my family incorporating my personal touches. Enjoy! 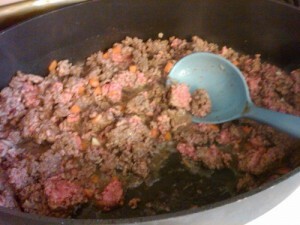 In a large bowl, combine the ground meat, garlic, bread crumbs, cheese, eggs, and some salt/pepper. Shape meatballs (size between golf ball and tennis ball). In a large pot, heat about 2 tablespoons of olive oil over medium low and fry the meatballs in batches. You will only need to cook the meatballs about 2-3 min per side as they will finish cooking in the gravy. Set aside meatballs on a separate plate. In that same pot, add the onions and a few pinches of salt and cook on medium heat until the onions start to become translucent. Then add the red wine and cook for about 2 minutes. Next, add the tomato paste and combine thoroughly. Then pour the cans of tomatoes plus a half of a can of water, a little bit more salt, and some pepper. Carefully put the meatballs back into the sauce, drop the heat to medium low, cover and simmer for at least an hour, stirring occasionally. The gravy can also be simmered for a longer period of time, 3-4 hours over low heat. Serve with your favorite pasta – top with grated parmesan cheese and hot red pepper flakes. Freeze leftovers in small containers for quick dinners. I first had this (minus the chicken) as a pasta course at a wedding this summer and fell in love, so I created my own version. I just love the combination of the salty prosciutto and the pop of the sweet peas in your mouth. Truly a decadant dish! If you have any questions/concerns/suggestions about this recipe (or any of them) please feel free to DM me! Preheat oven 400 degrees. 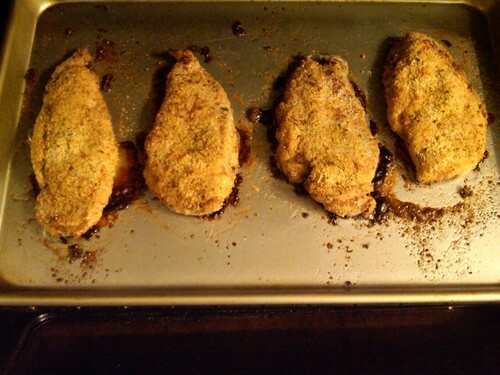 In one shallow dish, pour bread crumbs and parm cheese. In another shallow dish, beat egg with a teaspoon of water. Salt and pepper each cutlet lightly, then one at a time, drudge in the egg first then in bread crumbs. Place on lightly greased (I use some non-stick olive oil cooking spray) baking sheet and drizzle each cutlet with a little olive oil. Bake for about 15-20 min until chicken is no longer pink and the juices run clear. While chicken is in oven, start your water boiling for the gnocchi (cook as directed on package) . In a large non-stick skillet over medium low, heat about a teaspoon of olive oil. Add the prosciutto and cook for approx. 1-2 min, just until a little browned. Remove from pan and place on a paper towel so it will absorb some of the oil. In that same skillet, turn heat up to medium and add the tablespoon of unsalted butter. Once butter is completely melted, add in the flour. Whisk together for about 2 minutes until combined. Then add the milk. Continue to whisk until sauce begins to thicken. This will happen when sauce comes to a small boil. Once that happens you can reduce heat to medium low and add your cheese. 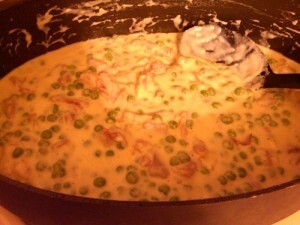 When sauce is done, add the prosciutto and frozen peas (they will thaw in the sauce) and combine. You can add a little cracked black pepper however, you don’t need to add salt as the prosciutto and cheese are salty enough themselves. When gnocchi is cooked, drain, mix in with the sauce and serve. Sprinkle with more parm cheese, crushed red pepper flakes, and garnish with chopped flat-leaf parsley (optional). 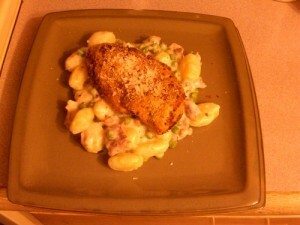 I like to spoon the gnocchi on the plate first then place the chicken on top but do it any way you want to. Enjoy!